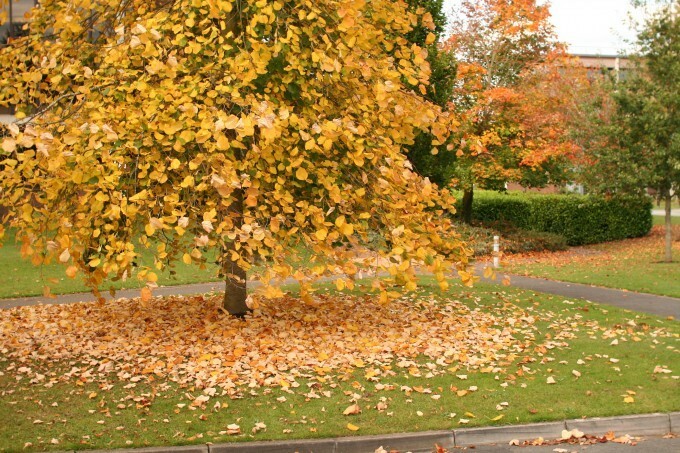 The falling leaves in Ireland, coming up to the festival of Samhain (Halloween). If you’re like me, you probably love Halloween. It’s been one of my favorite holidays for as long as I can remember…not QUITE up there with Christmas, but close! I mean, seriously…what kid DOESN’T like dressing up and running all over the neighborhood after dark begging for candy? In fact, with my daughter now off at college, I’ve been seriously considering borrowing a couple of children, just so I don’t miss a moment! (people tend to look a bit oddly at a couple of 50-somethings out trick-or-treating). The night of Samhain [Editor’s note: SOW-in…the first syllable rhymes with “sow” as in a female pig] , in Irish, Oíche Shamhna and Scots Gaelic, Oidhche Shamhna, is one of the principal festivals of the Celtic calendar, and falls on the 31st of October. It represents the final harvest. It is still the custom in some areas to set a place for the dead at the Samhain feast, and to tell tales of the ancestors on that night. According to Celtic lore, Samhain is a time when the boundaries between the world of the living and the world of the dead become thinner, allowing spirits and other supernatural entities to pass between the worlds to socialize with humans. It is the time of the year when ancestors and other departed souls are especially honored. Traditionally, Samhain was also the time to take stock of the herds and grain supplies, and decide which animals would need to be slaughtered in order for the people and livestock to survive the winter. This custom is still observed by many who farm and raise livestock, because it is when meat will keep since the freeze has come and also since summer grass is gone and free foraging is no longer possible. Bonfires played a large part in the festivities celebrated down through the last several centuries, and up through the present day in some rural areas. Villagers were said to have cast the bones of the slaughtered cattle upon the flames. In the pre-Christian Gaelic world, cattle were the primary unit of currency and the center of agricultural and pastoral life. Samhain was the traditional time for slaughter, for preparing stores of meat and grain to last through the coming winter. The word ‘bonfire’, or ‘bonefire’ is a direct translation of the Gaelic tine cnámh [Editor’s note: pronounced CHIN-eh krahv or CHIN-eh kenav, depending on dialect]. With the bonfire ablaze, the villagers extinguished all other fires. Each family then solemnly lit its hearth from the common flame, thus bonding the families of the village together. Often two bonfires would be built side by side, and the people would walk between the fires as a ritual of purification. Sometimes the cattle and other livestock would be driven between the fires as well. (You can read more of Caoimhín’s extensive notes on the subject in this thread at ILF). In addition, Samhain marked the beginning of the new year for the Gaels, with Oíche Shamhna being the rough equivalent of New Year’s Eve (if you’re currently studying Irish, you may be familiar with this construction from another holiday: Oíche Nollaig (EE-hyeh NULL-eg) — Christmas Eve). Of course, in Irish, the term remained, and is still, Oíche Shamhna (no need to adopt an English term when a perfectly good and traditional Irish one still exists!). And although the older practices now had the gloss of a different religion, they remained more or less the same. As is so often the case, many practices related to Halloween changed when it came to America. One of the most obvious (and ubiquitous at this time of year) was the substitution of a pumpkin for the more usual turnip lantern. Carved pumpkins were common in American harvest festivals long before they came to be associated with Halloween. As they happen to ripen right around the end of October, and are much easier to carve than turnips, it wasn’t long before they became the jack-o-lantern of choice. The term “trick or treat” appears to have originated in the U.S., though now it’s used in other places as well. Interestingly, though, the concept of the “trick” has altered. The more sinister concept of “give me a treat or I’ll play a trick on you” (which, fortunately, isn’t widely practiced anymore) seems to have been a uniquely American innovation (and one that, in my opinion, we’re well rid of). Perhaps the biggest change that happened, though, is that it was in America that Halloween gradually morphed into an essentially secular holiday. In fact, I’m often surprised that people seem only vaguely aware of its pagan origins, and completely unaware of its incorporation into Christianity. Oh well. I guess when you’re a six-year-old looking forward to roaming around after dark and begging for candy from your neighbors, such particulars don’t seem all that relevant. I find them pretty interesting, though, and I hope you do as well! In the meantime, does anyone know where I can borrow a kid or two? Did you already know all this about Halloween? Do you or your family have special Halloween traditions you’d like to tell us about? Please share your thoughts below! Thanks Great condensed overview Happy Years ending and begining ! peace and Love Sista !! !